Why not pop in for a cuppa? Send us a quick enquiry and we'll get back in touch! I consent to being contacted directly by HeadRed on my enquiry either by email or phone. Why not pop in for a cuppa? Arrange a meeting by contacting us. Pennard Hill Farm offers breathtaking views and luxury boutique accommodation within close proximity of Glastonbury Festival. Now in its fourth year, Pennard Hill has everything a festival goer needs, from a selection of accommodation to the opportunity of pampering yourself. The farm’s beautiful yurts, traditional tipis and fantastic airstreams make the Glastonbury experience one to remember. Whilst staying at the farm, guests can take advantage of a number of facilities. Meals are freshly available to order and can be tailor made tailor made for individuals. Guests can also sit back and relax beside the indoor heated pool and explore the 80 acre estate. Having worked with Pennard Hill Farm for the past 4 years, HeadRed were well equipped to design their brand new website. 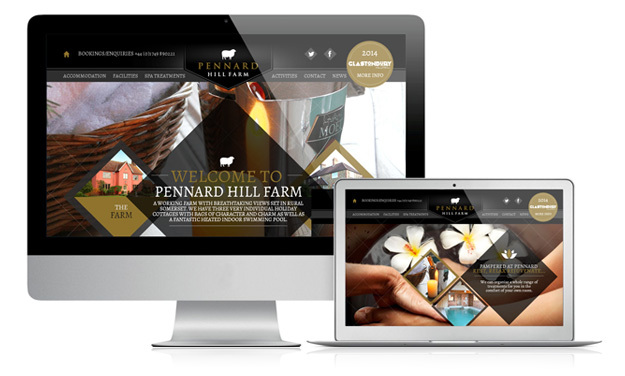 We were also asked to design Pennard Hill’s logo and custom icons, as well as writing marketing literature and managing social networks.The design concept behind the site was to reflect the farms character and charm as well as its tranquil country setting. The new responsive site is perfect for music lovers on the move, making it easy to browse in any setting. Please visit the Pennard Hill Farm website and let us know what you think.